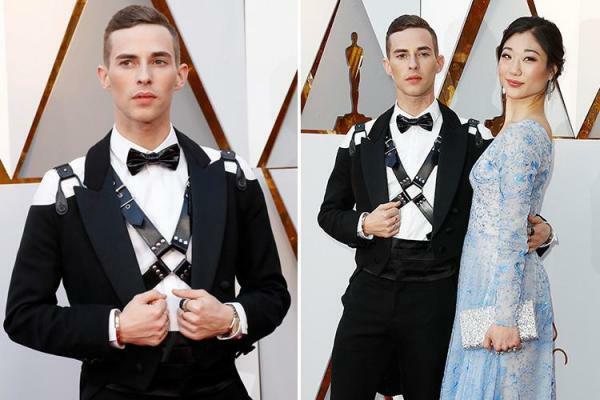 Adam Rippon and Mirai Nagasu at the Oscar. Dance pair moved from Europian – Russian dominance to North America in 2010. This is from old clip. Flamenco was part of original dance number which Virtue & Moir won. 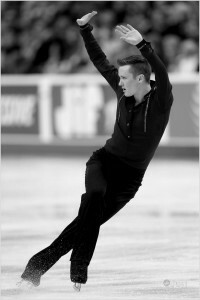 Davis & White Free skate 2010. US Championship on youtube (They were much more spectacular and powerful at the Olympics). Grieving Rochette skates to Bronz, the world united with her in tears. Watch Johnny Weir Olympic freeskate here. direct link. I know what you’re saying: Well, that’s just Johnny being Johnny. 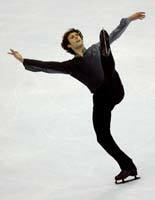 But Stojko was an “athletic” skater compared with Weir’s “artistic” style, yet he has the same complaint. “Before, you could really put the personality into your routine,” Stojko says. “Now, so much of your time is spent getting up the points that it ties the hands of the skaters. There are too many requirements. Look what they can deliver, so refreshing. We need to rescue talented figure skaters from these judges. I hate being entertained by well choreographed, musical programs! More tacky posing to catch breath for the next jump is what skating needs. Now I’m going to go watch a real sport where they really push the envelope: under water basket weaving. Men’s Long. Abbott has one of the most beautiful programs in the event. Unfortunately, Jeremy Abott who is now US champion melted at the Olympics.. He did not have enough experience in the international competition. Here in this clip performed flawlessly. His breakthrough came in 1962 when provided the soundtrack for the epic Lawrence of Arabia, for which he was awarded an Oscar. 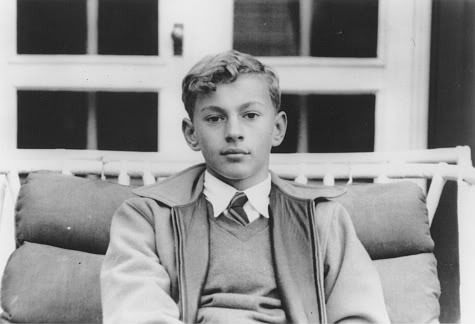 He went on to compose music for more than 150 films. Here are some figure skaters who won their gold with his film scores. Most of youtube figure skating clips are in Korean these days – the whole country has gone crazy for Yu Na Kim. Her rival Mao Asada, last year’s world champion did not medal this year. The silver went to Canada’s Joannie Rochette and the bronze to Japan’s Miki Ando. We usually see unhappy or disappointed silver and bronze winners, not this year the two seemed very happy to stand next to magnificent Queen Yu Na. Yu Na Kim animation video is here. This Frenchman who defected to Italy skates in a Macaroni Western. Long legged Carolina Kostner had a disaster performance, but no matter, she can win for having the best costume. Carolina won siver here at European Championship. This was the most satisfying and fantastic men’s competition we have ever seen. Two artistic skaters were rewarded with gold and bronze and an athlete came back to sneak in to take the silver. Brian Jourbet performed brilliantly with great power. He has improved in many areas. Kurt Browning helped him with his footwork. I have been watching old elegant skating by John Curry on youtube. Today is Philip Glass‘s birthday; a good way to celebrate his birthday is with a piece done by two great skaters from the forgotten past. 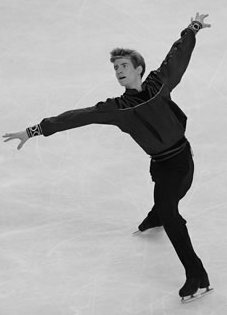 Curry wanted to introduce the idea that figure skating can also be an art form, not just a sport with medals, winners, and losers. He was light on his feet like Fred Astaire, see here. 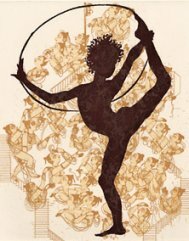 Today Sasha Cohen, Johnny Weir, and Matt Savoie have inherited Curry’s elegant skating. His life was cut short with AIDS. Found this article claiming that he died in the arms of Alan Bates. Today is Isabelle’s birthday my all time favorite cross-dresser. Isabelle Eberhardt (Feb. 17, 1877 – October 21, 1904) was an explorer who lived and traveled extensively in North Africa. Isabelle did not have to fake to be a princess, (unlike Johnny Weir) she was a real Russian Princess, who was imprisoned at one time suspected of spying. She died in a flash flood. Her life was a mess. Isabelle Eberhardt was a true eccentric, flamboyant, courageous and totally unconventional. More images of Isabelle, here. Now lets focus on the champion males from very recent competitions. Rufus and Plushenko won the best in show and the bad news for other competitors is that Plushenko will continue his amateur career. The Russian federation will not allow Plushenko to retire, they have no successors. The good news is his body may not hold up to the next Olympics – his specialty is executing those incredible jumps and he has been plagued with injuries in the past. Here are my picks of the best from the Men’s figure skating competition last night. “Matthew Savoie delivered another beautiful program. 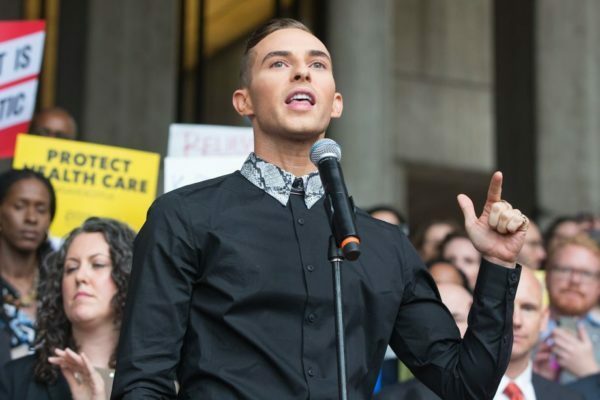 His presentation may be understated and quiet, but it stirs the emotions of the audience. Savoie reminds me of the legendary John Curry. His skating is pure, effortless and moving. He can be proud of his Olympic experience.” (Zimmerman from yahoo) More photo and praise for Matt here. Matt Savoie should play abbe of the diary of the country priest or Lancelot du Lac– he is the ideal skater to tackle Robert Bresson. The law school can wait, he should entertain us – see the clip of “The Mission” from US National 2006″. See The placement here. Both Savoie and Takahashi should be on top of Joubert. But the judging system seems to be fixed – they still manage to cheat. The order of finish, second through forth is exactly the same as last year’s world men’s championship except that Plushenko is back from injury to take the gold and move the others down a position. The new system is so complicated that nobody can figure it out – very clever. Dale from Scribble writes about Olympics. 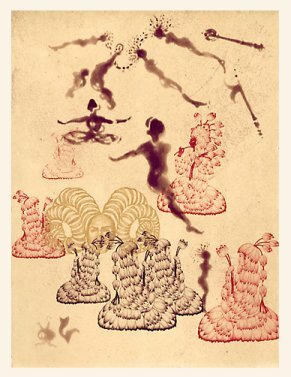 is by Shahzia Sikander, see more at Crownpoint Press and here. The two elegant, exquisite lolitas or (Princesses) are growing and maturing as artists – both naturally gifted one with pen and brushes, another with skates on ice. Both are endowed with genuine creative spirits. Off ice Sasha takes cooking lessons, designs clothes and talks to her fans from her website. Shahzia was born in Lahore, Pakistan and graduated from Rhode Island School of Design. “IB: You began your interrogation of miniature painting in the late 1980s in Pakistan at the National College of Art in Lahore. What was your initial interest in working this way? Another Princess, Chelsea was spotted in India. Margaret Cho visited India too, read her blog and see the pictures.